You may be wondering, What is Sundowning? Does dinnertime prompt a behavior change in your older parent? It’s probably not your cooking. As a caregiver for a family member with Alzheimer’s or another form of dementia, you may be facing some behavioral changes that you don’t understand or may be out of character for them, starting in the evening. This is referred to as sundowning. It’s a marked change in behavior or state of confusion in someone with dementia that seems to be triggered by the fading light outside. Although the exact science of why this occurs is still unknown, many researchers believe that dementia disrupts a person’s natural body clock (circadian rhythms) that signals them when to wake or sleep. 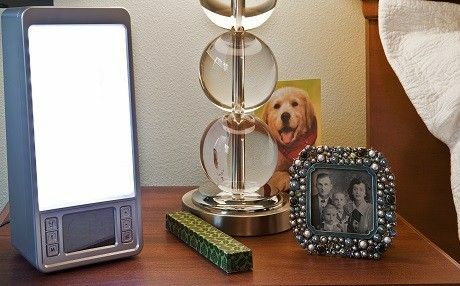 To manage sundowning, Aegis Living has integrated light therapy programs into our memory care communities. In select communities, residents receive a dawn simulator in their apartment to help reset circadian rhythms. It can provide a natural start to their day and signal the end of the day. Our residents also benefit from a specific duration of specialized lighting in the dining area and a gradual decrease in light throughout the day to reset melatonin levels. Try to keep your mom on a regular schedule every day and that includes a bedtime routine. We suggest that you reduce background noise and stimulation at night, especially the television. Fatigue can add to the behavior changes associated with sundowning, so getting a good night’s sleep is important. This may mean limiting naps during the daytime. Get outside during the day for exposure to the sunshine to help set her internal clock. In our Aegis Living communities, we provide clear umbrellas on rainy days so residents can walk outside and still get a dose of vitamin D.
Consult with her physician if you suspect there may be an underlying issue, especially if her sundowning behavior happens rapidly. Something as simple as dehydration can impact the behavior of your mom. If you are looking for a memory care community for your mom, our marketing directors are happy to schedule a tour and show you and your family the services we offer our residents at Aegis Living.